The Governors Highway Safety Association has recently released a report that shows a 28% increase in fatally-injured drivers with known results that have tested positive for drugs between the years 2006 and 2016. 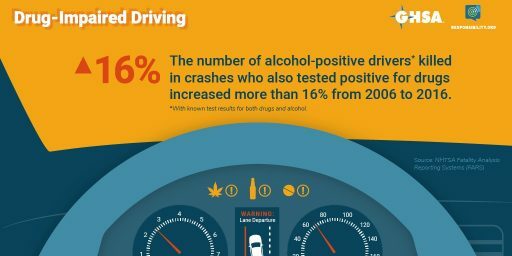 Driving while impaired by alcohol is still a major, national safety concern, but there has also been a 16% rise in drivers that had alcohol and another drug in their system at the time of the accident. Opioid and marijuana stats have also increased over the ten year period, and the combined drug results has surpassed the alcohol related results. Poly-drug use, or the use of multiple potentially-impairing substances simultaneously, is becoming more prevalent even though the impairment effect is increased. Some feel they are still safe, or even better at, operating a motor vehicle while under the effects of substances. Drug Free Collier would like to take this opportunity to raise awareness about impaired driving. 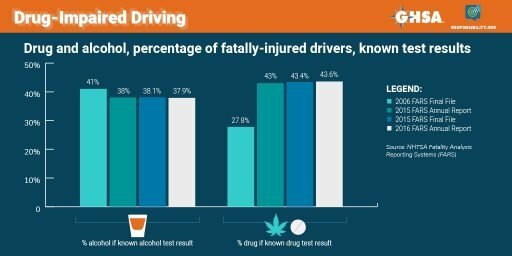 The study released by the GHSA focuses on the effect of drug-impaired driving, but the matter goes much deeper than just illicit drugs and alcohol. Certain over the counter medicines can cause drowsiness and slow reaction-times, which will impair a person’s driving ability. These are common medications such as sleep aids, antihistamines, antidiarrheals, and anti-emetics (medicines that treat the effects of motion sickness). Unfortunately, some people believe that all medications, over the counter or prescription, are safe and will not affect their everyday life. On each box or bottle is a drug fact section that will list side effects and give warnings if a person should not attempt a particular action while taking the medicine. Please be aware of what you are putting into your body and what you will be doing while it is in your system. If the recent opioid epidemic has taught at least one thing, it’s that we need to be more careful with the medicines we take. For the teens and young adults of Collier County, distracted and reckless driving are still major safety concerns. While distracted driving has seen a 2.2% decrease nationally, reckless driving has gone up by approximately 5%. Many know that using a cell phone to call, text, snap, tweet, or Instagram qualifies as distracted driving, but the category also includes eating, drinking, applying makeup, adjusting the radio/GPS, and even holding a conversation with a passenger. The top causes of fatal injuries for reckless driving are speeding and not wearing a seat belt. Being distracted will impair a person’s driving ability. If you add drug-impairment on top off distracted/reckless driving, the chances of being involved in a fatal accident only increase. If you or someone you know has been affected by impaired driving, please visit our friends at MADD Southwest Florida.